is now completed and live. 1 ON 1 developed a new concept for the band using the information provided to us by the band's members. We devised a fresh, very cool apprroach with a modern design style. We also designed the new "Blast Off" album cover artwork. It's now live on iTunes! Following our "design overhaul" Mad the Martian won the 2013 Indie Channel Award for "Best Alternative Songwriter". NO!... You are the CEO of your own business! Whether you got into music to land a deal with a major label, perform live, sell CD's or get your music heard, you are a business owner. You are the entrepreneur. Your music and image are your products. From the moment you recorded your first song, you started a business. You wanted to get your music in front of the world and probably want to earn a decent living doing what you love most. This is how we at 1 ON 1 see you and how we will treat your music career.... as your business. This is how you need to start seeing YOURSELF... as the CEO! This is how we see you at 1 ON 1 Entertainment. When it comes to marketing, beginners and experts will agree that there are several "constants" required for any campaign to succeed: Professional Design and Repetition of marketing and advertising are at the top of that list. If advertising was a simple matter of ®Pepsi placing only one ad on TV, they wouldn't be spending millions of dollars, often on a single ad campaign. Instead, you see ads for ®Pepsi, ®Coke, ®Burger King, ®Nike and so many other huge companies everywhere and all the time. Repetition. This is the key for any Marketing Plan to succeed. "I understand what it takes to be an indie artist. I've been there... I'm still there. But we all have some amazing tools literally at our fingertips to help us. The trick is to learn how. Creative people need to start seeing themselves as 'Entrepreneurs', and treat their careers as their 'Business', with their work (songs, paintings, films, etc.) and their entire "online image" as the products they offer". Regardless of where you are now in your career, every artist needs professional design and marekting. All your social profiles need to be unified in theme and design, like your Facebook and Twitter header images. a professional firm like 1 ON 1. The difference is at 1 ON 1, we will work WITH you "One on One"! in some very competitive markets... including the music industry! Fill out our Contact Page to get started. Are you ready to take it to the "professional" level? 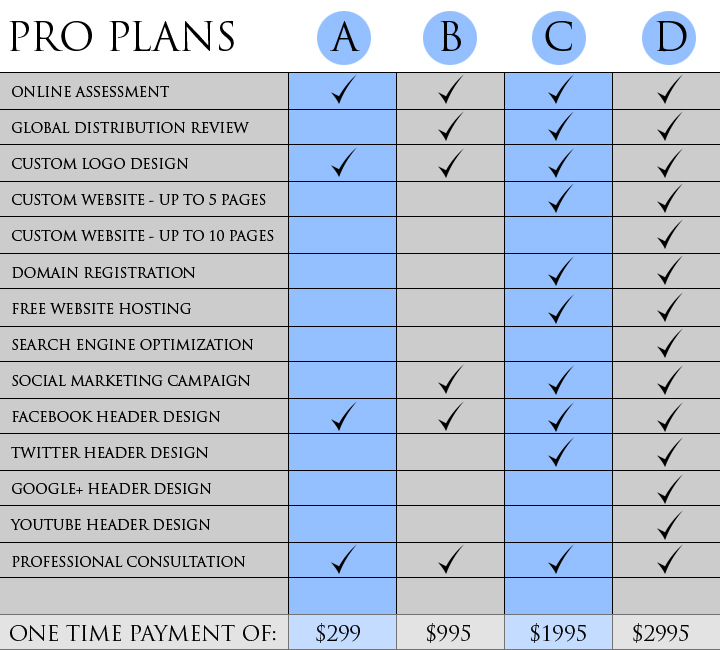 Choose one of our Pro Plans! Choose your Pro Plan to get started right away! Up to 5 page website *Custom Designed, based on your input and design preferences. Buy Links and 3 custom email accounts. 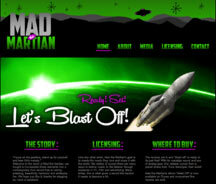 Up to 10 page website *Custom Designed, based on your input and design preferences. *Original, Custom designed professional website without the use of any templates such as Wordpress or Joomla, etc.. Installing audio players on website requires access to account where player is located, or completed html embed code emailed to us. YouTube video inclusion on website requires account access or prewritten/formatted embed code. Completion dates will be dependent upon the lines of communication you are able to offer. The faster you can write your text and deliver the things we need like pictures, video embed codes, players, videos, bio text, etc., the faster we can finish. Payment is required at the beginning of the project. No exceptions. Once we receive your payment, work on your project can commence. If you choose Pro Plan C or D, please have a few website examples which you and your band or partners agree that you all like. This will give us a good idea of your personal design preferences and tastes. The the Marketing and PR Services below, which 1 ON 1 offers are also available on a "One Time" basis. For more details or if you have questions, feel free to Contact Us. If you are interested in getting global distribution for your original music, please visit THIS PAGE. Every business, including artists and bands, need a professional brand identity, a logo, something recognizeable that fans can easily recognize as YOURS! The same holds true for a website. PLEASE do not use canned solutions, templates or try to do it yourself, unless you are a skilled designer. Sure anyone can learn a program and "build" a website, but a professionally "designed" website is a different animal completely. For full website design requests, please email results@1on1ent.com. We will usually respond within 24-48 hours. Please include your contact information and any relevant information such as your current website (if applicable), howl long you've had this website, what your goals are, how many pages you will need and what special features you would like your new website to include. Posting to Social Networks is a lot more then "Hey everyone, check out our new song!" The name of the game is Engagement... Interaction. 1 ON 1 can help.  Maintaining Pinterest and pinning show/performance pictures etc.